Three years ago, I had a wild idea to find a service trip in the United States where I could take a group of my students to experience a new culture, help a community in need, and grow together as teammates. I’ve traveled on service trips before, but only overseas. It is striking to me how much need exists within my own country. I don’t think that everyone is fully aware of the need. I want to help change that. Now, in 2015, I am taking my third group of students from the Wegmans School of Pharmacy to Browning, Montana. 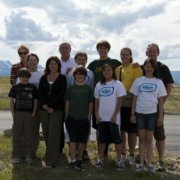 We are traveling with Global Volunteers to participate in community service projects on the Blackfeet Reservation. We have 15 students on the trip—our largest group yet! As a bonus, I also have my 15 year old nephew along for the ride! When the trip is complete, 30 of our students will have served this community in three years. I am so excited for the group this year to experience the culture, meet members of the community, and help out groups in need. The thing I loved most about this service trip my first time around was all the people that I met. In Browning, we are affectionately known the “the Globals.” People seek us out and are always friendly. They share stories of their lives, their history, and their challenges. Each of the students that have traveled here with me learned a tremendous amount and were humbled by the generosity of openness of our hosts. Traveling with students is a remarkably rewarding experience. While we normally interact in the classroom, spending a full week together creates a once-in-a-lifetime bonding opportunity. I am so grateful to help give students the opportunity to travel here and realize the difference that we can make, one team and one week at a time. Subscribe receive notifications of new posts and updates by email. Global Volunteers is an apolitical, non-sectarian, non-profit (501C-3) tax-exempt organization. Send feedback about this web site and its administration.